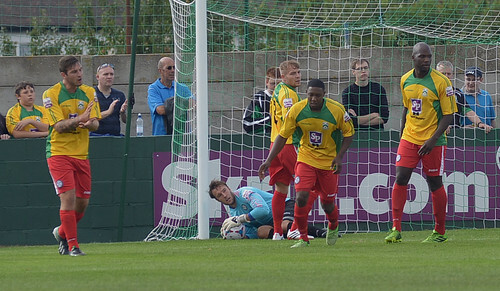 Hednesford Town’s first away defeat of 2013 and their first anywhere for 21 matches, typically came against a North Ferriby United team who last season had pipped them at the post for the Evo-Stik Northern Premier Division title and, while The Pitmen undoubtedly had an off day, the fulcrum of The Villager’s attacking nous, Anthony Wilson, looked a cut above with a goal in each half. The striker, playing alongside the equally prolific Nathan Jarman in attack for the hosts, scored the vital second goal before half time, but the opener, scored after just 70 seconds, will certainly be one that Hednesford’s boss Rob Smith looks back upon with frustration. 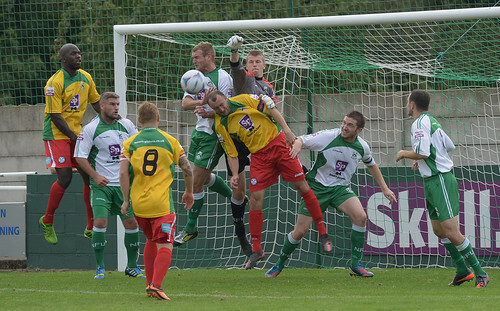 A debatable throw-in was given to the home side and while The Pitmen napped in defence, possibly still trying to adapt to playing in North Ferriby’s rather garish yellow and green away shirts after an error meant Hednesford were unable to wear their away kit, Jamie Yates found too much space at the back post and stroked the ball past Dan Crane. 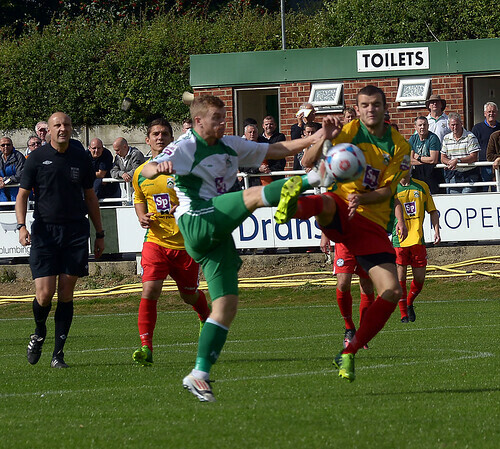 The Pitmen, to their credit, didn’t let the early goal get on top of them and Kris Taylor twice saw well measured left-footed shots from distance clawed away from goal by Ferriby keeper Adam Nicklin. In a very open and end to end game, Nathan Jarman hit the side netting from a tight angle and Crane made a wonderful save at full stretch from Wilson for the hosts, just after Neil Harvey almost chipped Nicklin from distance for the away side. The game turned, however, on two passages of play shortly before the interval. 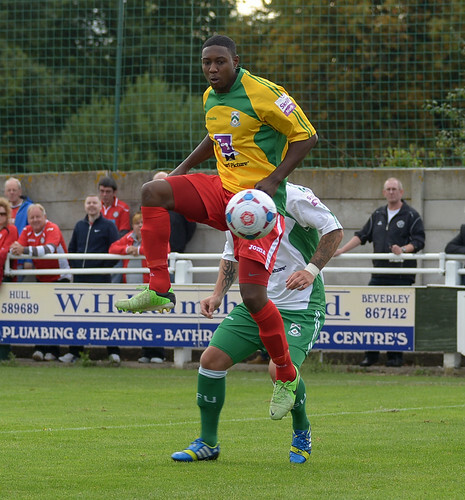 Firstly, Hednesford seemed to drop off as they defended their 18 yard line, possibly expecting the half time whistle to be blown and that moment of hesitation was seized upon when Wilson superbly controlled a deep cross, fended off the advances of Francino Francis and tucked the ball under the body of the advancing Crane. 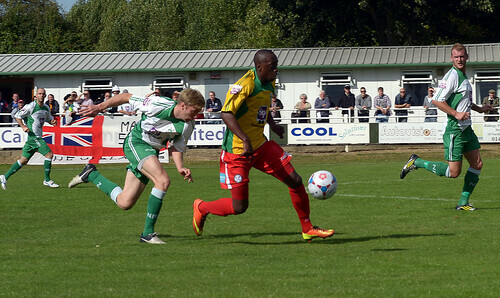 2-0 down at the interval was likely to be a terminal situation for the visitors but, in a hugely controversial decision, the referee adjudged that Aaron Rey had tripped over his own feet when most in the ground, including the offending Nicklin in Ferriby’s goal, were expecting a penalty which, given Elliott Durrell’s astonishing spot kick record, would have given Hednesford a superb chance to halve the deficit. 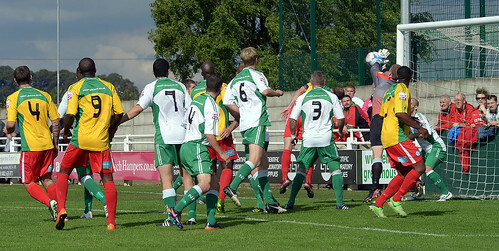 As it was, the decision wasn’t forthcoming and aside from a stinging second half volley by John Disney, which whizzed just past the far post, Hednesford were unable to break the resolute Ferriby defence down and, as they desperately pushed forward, Anthony Wilson tapped in with ease to give the score a gloss for the home side.